The Jack O'Lantern beams through the night. Its candle burning bright. 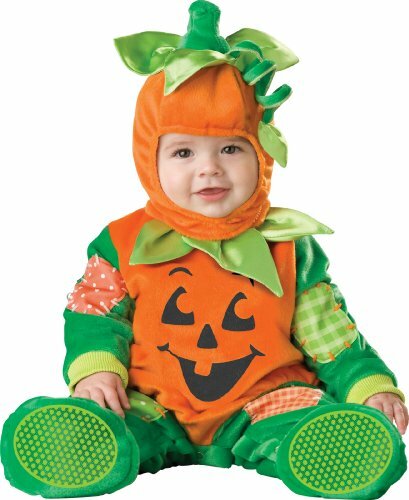 But who's looking at that, when you have this little cutie-pie dressed up as a pumpkin! Halloween houses are glowing brightly, with their ghastly fire-lit faces scaring away the monsters. But look! One is moving! The sweetest, little pumpkin of them all! Let all the other infants go trick and treating as boring ghosts and ghouls. Your baby's outfit tops them all. Behold! The Halloween Pumpkin! A Jack O'Lantern on tiny legs, looking cute as a button tonight. This adorable Lil Characters outfit is the full package. You receive the lined and layered jumpsuit, hat and booties, as three parts of the same costume. Snap-button press studs between the legs allow for quick access for changing a diaper. I've listed it as newborn through to toddler not because one size fits all. You will have to match the outfit to your own little one, as it comes in a variety of them. It's 100% polyester and machine washable. 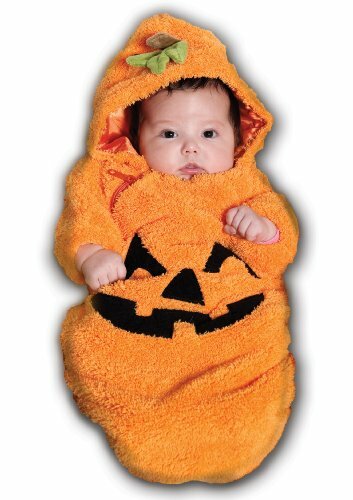 The quality means that you'll be able to use it for many Halloween events, then pass it on to the next baby later! Looking for a canine Jack O'Lantern suit for this night of ghoulish madness? These are the gourd-liest Halloween dog outfits around! Timing is all on this one. It's probably the smallest Halloween costume around! 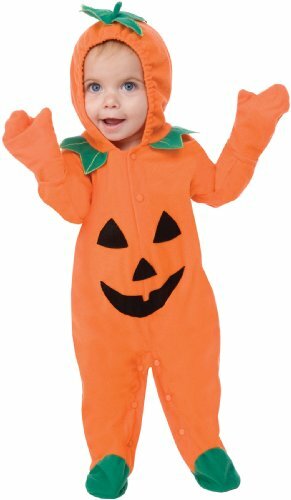 The Unique Newborn Baby Pumpkin outfit is an all-in-one piece. The deluxe satin tunic has the hat attached as a hood. That will save you having to try and keep it on! However, this costume does not include the tights/leggings, nor the sweater underneath. You will have to match those yourself. I can't see your little one getting much wear out of this, but only because he or she is going to quickly grow out of it! 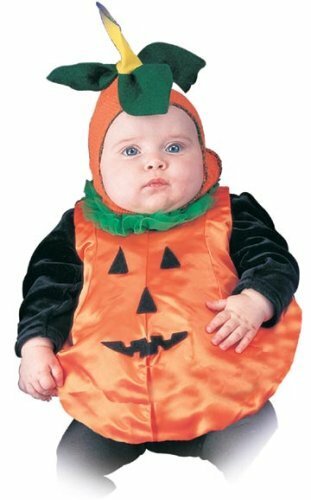 There are three baby bunting pumpkin costumes to choose from here, but all have their pros and cons. The first is a plush, lined and extremely warm affair. It's perfect for those celebrating Halloween in chillier climates. The hood is attached, so there's no fear of losing it. However, smaller infants might find themselves buried in the material. There's so much of it and it's very thick. Also, it closes with a zipper, which can get caught in the plush, unless you take care in closing it. The middle one is a fleecy warm offering from Rubie's Costume Company. The headpiece is separate to the main bunting. A fabric fastener allows quick access to change a diaper. I hesitated before including the final baby bunting, as it has a warning on Amazon. Apparently it contains small parts and therefore it is not fit for infants. That kind of defeats the purpose. However, I've pored over the description and can't see what small parts could possibly be included. The Precious Pumpkin jumpsuit has the hood attached. The mittens come separately, as part of the same costume. 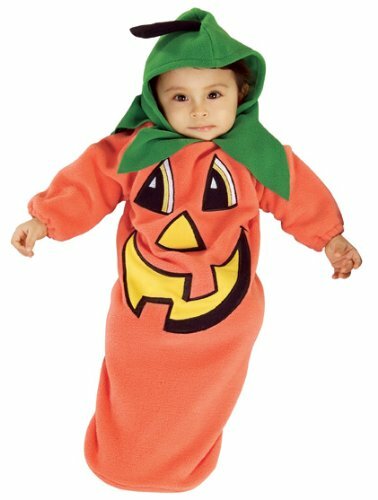 It's a warm, fleecy body suit, which will be perfect for taking baby out trick or treating; and to all of those Halloween events. There are buttons up the legs and back, which blend in nicely with the rest of the outfit. These allow for easy access to change that inevitable smelly diaper. The same buttons are there at the throat. They close to leave baby snug inside. It is very easy to put on and take off. What isn't obvious in this small image is the detail on the leaves. On both the onesie and the hood, there's embroidery, which really brings out the leaf pattern. 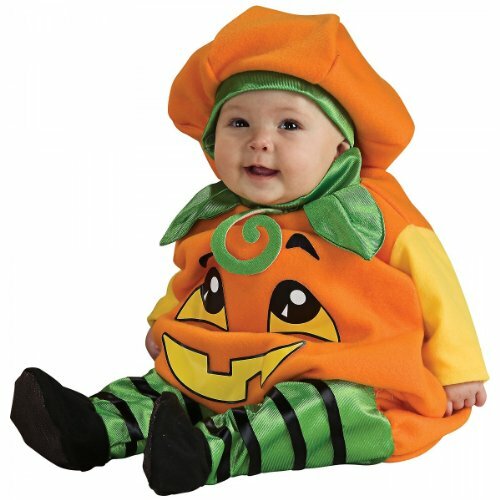 Fun World Costumes have produced this ultra cute pumpkin outfit for infants. It comes in two pieces. The body is a pull over tunic, which fastens at the back with a strip of Velcro. The hat is separate, but arrives as part of the costume. It may be a little large for smaller babies, so be prepared to tuck it in with a safety pin. You will have to add your own black (or orange) leggings and sweater. The bright grinning face will be a hit at your Halloween event; and I'm not talking about the one on the tunic! I have to admit that this one is my personal favorite. That little fellow has such a cheeky grin; and the costume is adorable. The tunic and headpiece are separate here, but arrive as part of the same outfit. You will have to match your own booties. The green, striped leggings are there though. They are attached to the main jumpsuit. The whole ensemble is 100% polyester. 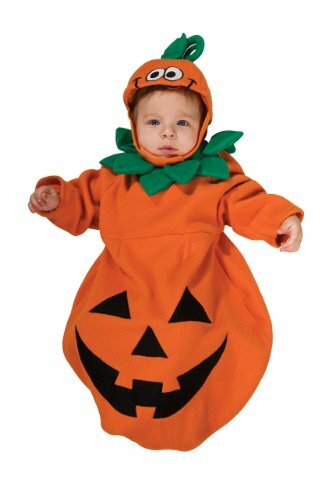 This pumpkin outfit does come a little small, so be wary if your baby is closer to one year old than six months. I just love it though. I'd be highly tempted by this, if my little ones were in that age bracket! Hubble! Bubble! Toil and... awww! 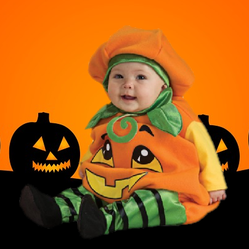 Remarkably cute infants in witch outfits for Halloween! Bewitch your neighborhood with these spooky costumes. Clitter, clatter, scary bones. The skeletons are out dancing tonight! And that little one at the end is the sweetest in all the neighborhood. Oooh! OooOOOhhh! Oooh! At least try to look a little scared, as you have a cute attack over this little one. Baby is in a Halloween ghost outfit! Aww! That would be too cute! The little kid at the end? That's exactly what I thought!